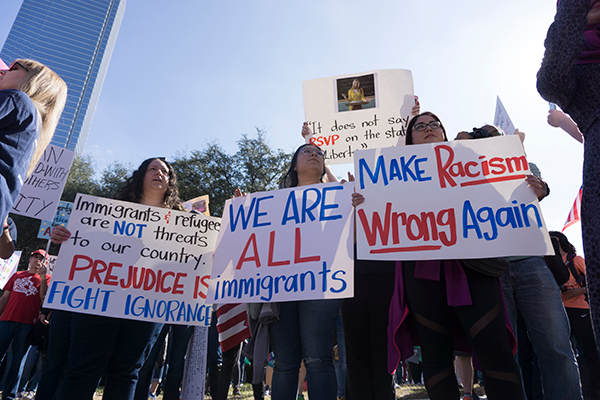 Protesters hold pro-immigration signs at the Dallas Immigration March on Feb. 18, days after Senate Bill 4 was passed by the Texas Senate. Photo by Andrew Gonzales/The Et Cetera. The Texas House of Representatives voted on April 27 to ban sanctuary cities and compel local authorities to comply with immigration laws. After a 93-54 vote along party lines, the bill is now headed to the governor’s desk and is expected to be signed into law. Texas Gov. Greg Abbott designated the bill, Senate Bill 4, as an emergency item for the Legislature in January. The Texas Senate passed the bill in February, and the House passed it after more than 15 hours of debate. History professor Michael Noble, a Republican voter, said the bill would create an increased sense of fear and negativity on college campuses across North Texas. He believes that Eastfield will not allow Immigration and Customs Enforcement to arrest students on campus without a warrant. President Jean Conway said because the definition of a sanctuary campus so disputed, it’s difficult to even consider Eastfield as one. A protester holds both a Mexican and American flag during the Dallas Immigration March. Photo by Andrew Gonzales/The Et Cetera. Eastfield intramural sports coordinator Jide “JC” Carew said he believes Dallas County community colleges are already considered sanctuary campuses. The issue has sparked discussion across the country. In North Texas, several university students urged their campuses to adopt sanctuary status, including the University of Texas at Dallas, University of Texas at Arlington, Texas Woman’s University and the University of North Texas. UT Arlington held a referendum April 18 when students voted to adopt sanctuary status, but President Vistasp Karbhari said the campus will not label itself to avoid losing school funds. President Donald Trump signed an executive order that would withhold funding from sanctuary cities, but federal Judge William H. Orrick blocked the order, writing that Trump overstepped his executive powers. Orrick’s ruling said that only Congress could place such restrictions on federal funding. Speech professor Mary Forrest said she opposes legislation that would harm student development, regardless of their immigration status. Protesters march through Dallas for the Dallas Immigration March. Photo by Andrew Gonzales/The Et Cetera. Noble said that he wouldn’t be surprised if the bill is signed into law, but he is against the bill’s premise of outlawing sanctuary campuses and allowing ICE on campuses. Josh Nelson, a psychology major and vice president of Phi Theta Kappa, believes that labeling Eastfield as a sanctuary campus would hurt the college as a whole due to potential funding cuts. Nelson said that, while he supports DACA, which protects undocumented immigrants brought to the U.S. as children from deportation, sanctuary campuses should not be allowed. Computer science major Lava Pokharel, an international student from Nepal, said he believes students should commit to the legalization process put in place. “I filled out many legal documents to be here, and I think everyone should be legal,” Pokharel said. It is still unclear how the bill will affect Eastfield directly, but Noble said he believes the entire state can also face deeper repercussions from SB4, using a similar bill from Alabama as an example. Alabama’s House Bill 56 was passed into law in 2011 but caused the state’s construction and agriculture industries to suffer. It also led to the arrest of German Mercedes-Benz executive Detlev Hager and Japanese Honda executive Ichiro Yada, potentially costing Alabama the construction of automotive factories.